Home Tags Posts tagged with "anti matter"
According to a Physics Review Letters report, the question of whether normal matter’s shadowy counterpart anti-matter exerts a kind of “anti-gravity” is set to be answered. Normal matter attracts all other matter in the Universe, but it remains unclear if anti-matter attracts or repels it. The research says it has prepared stable pairs of electrons and their anti-matter particles, positrons. A beam of these pairs can be used to finally solve the anti-gravity puzzle. For every particle in physics, there is an associated anti-particle, identical in every respect that scientists have yet measured, except that it holds an opposite electric charge. Current theory holds that, at the birth of the Universe, matter and anti-matter were created in equal amounts. When they meet, however, they destroy each other in energetic flashes of light. The question has remained, then, why did any Universe come into being at all, and why is the one we see overwhelmingly made of normal matter? One of the characteristics that may differentiate anti-matter is its gravitational behavior. Most scientists believe that anti-matter will be attracted to normal matter. 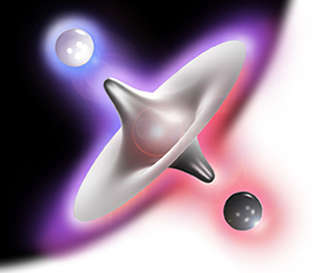 Others are not so sure; anti-matter may repel – it may “fall up”. That has implications for the question of why the Universe didn’t disappear into a grand flash of light just as soon as it formed. It also might help explain why the Universe is expanding ever more quickly. It has simply been impossible to test the idea, but researchers at the University of California Riverside are getting closer to addressing the question once and for all. They have created electron-positron pairs that are in stable orbits around one another – the result is called positronium. The pairs are kept from bumping into and destroying each other by carefully dumping energy into them to create what are known as “Rydberg states”. Like the lanes of an automotive test track, particles can move into different orbits around one another if they reach higher energies, and these Rydberg positronium atoms are spun up to high energies, lasting for a comparatively long three billionths of a second. The team hopes to extend the method, up to a few thousandths of a second, preparing a beam of the artificial atoms and seeing just which way they fall.